What do I need to know about an auto rickshaw? Think of it as a covered bicycle with a fuel-efficient lawn mower engine. 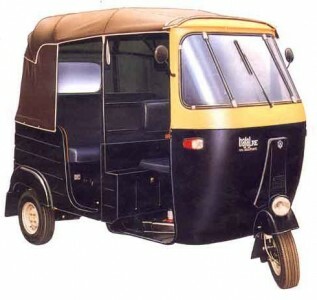 Auto rickshaws, also known as tuk tuks, are common vehicles in India and several other countries. Though variable in size, the rickshaws used for the Rickshaw Challenge will seat up to 3 people (1 driver in the front seat and 2 passengers in the back). Though the design of the rickshaw cannot guarantee complete safety and security, the low top speed of the vehicle contributes to major accident prevention. It is common for these 3-wheeled vehicles to break down, especially older models. They are however, easy to repair and as locals drive them throughout India, there is no short supply of repair shops or autorickshaw mechanics.